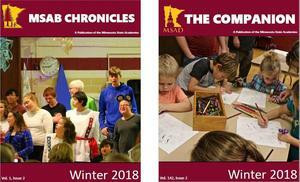 The Winter 2018 issues of MSAD's The Companion and MSAB Chronicles are available - take a look! Click here for information and updates on current bills, bonding and budget proposals. The calendar can be found under the "About Us" menu. Ordway Music Theater will have an ASL interpreted and audio described performance of Air Play on Saturday, March 2 at 11 AM. Come an hour prior to participate in fun activities in the lobby (hosted by the Science Museum of Minnesota). Minnesota State Academies is closing both campuses for the remainder of the week due to extreme cold weather. Click above for more information. Join us at the 2018 White Cane Safety Awareness Day Celebration at the Minnesota State Capitol! MSAB and MSAD will be holding commencement exercises on Friday, June 8. Come and join us! Wellness Committee can now be found under the INFORMATION menu!